First you might wonder why I really biked all the way to Montebello and back (28.29 miles) to buy egg nog? Well, this is not just any egg nog. 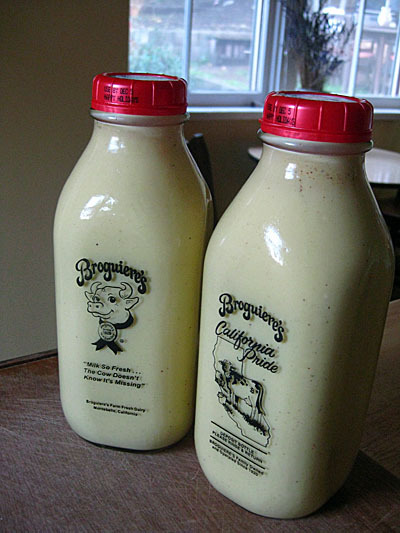 This is Broguiere’s Egg Nog. 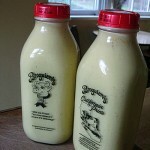 THE BEST egg nog I’ve ever had. And sure, I could’ve biked (probably about the same distance overall) to stores in the vicinity and beyond hoping and praying I might find some in stock, but the trip out to the source has become something of a holiday tradition, albeit up until this year it was done by car. See, when it dawned on me that it was three days until Thanksgiving and our fridge was lacking the seasonal staple, I loaded up the two glass bottle empties from last year into my backpack, headed out to make the trek to trade them for full ones, and on my way there wouldn’t you know that a press conference had broken out on the lawn of the new LAPD headquarters at the corner of 2nd and Spring streets to inaugurate the new buffered green bike lane that was installed on Spring from Cesar Chavez all the way down to 9th Street. So I stuck around for the speeches and then went on the ceremonial first ride along the wonderful lane, then headed up and across the 6th Street Bridge and out Whittier Boulevard well into Montebello, coming back the same way. This entry was posted on Tuesday, November 22nd, 2011 at 5:14 am and is filed under biking, civics, commerce. You can follow any responses to this entry through the RSS 2.0 feed. Both comments and pings are currently closed.